A well-written reminder and a more in-depth view of why Kimi is having such difficulties in the 2014 Ferrari. I had to repost as the reblogging fucked up my site format. Originally posted on pitlane talk. The very nature of the Prancing Horse’s cars after Schumacher’s departure consisted of stubborn understeer throughout the years. Nothing that a few setup changes couldn’t solve, or resources couldn’t handle. Kimi shined at Ferrari in 2007 and, despite a few off moments, was on it in 2008 and 2009 as well. So what has changed at Ferrari that gave Kimi such a shock struggle in Melbourne this year? Since 2012, Ferrari decided to develop their cars on the basis of a PULL-ROD SUSPENSION, something that was abandoned by teams at the end of 2010. The solution has its advantages, as it lowers the nose and the suspension, along with the center of gravity. However, the problem lies in fine tuning. One of the major disadvantages of a pull-rod approach is the limitation on adjusting the car’s handling, which is due to difficulty accessing certain areas of the car. For example, in the case of a rear pull-rod, you have to remove the floor as well as the gearbox to fine tune the rear end because there’s simply no space to operate around the springs. Therefore if the car’s handling is fundamentally understeery, it’s simply impossible for Kimi’s crew to counter that with more oversteer in two practice sessions. There’s not enough time to disassemble and reassemble the car until Kimi is comfortable with the handling as it’s usually difficult to get it right on the first try. Even if the mechanics are able to find the optimum input, the pull-rod suspension is a stubborn system that usually doesn’t react as precisely to setup changes as a push-rod. Spending Friday practices in the garage picking apart the front end of the car is not a solution, especially this year when every kilometer counts. Repackaging the front pull rod would be a solution, but it would affect the overall balance of the car and could make things worse. The quickest way would be to induce oversteer aerodynamically, which is why Ferrari will manufacture new parts for Raikkonen to solve his problems. Even that might take a few good weekends. Fernando Alonso is able to cope with the system a lot easier, having raced with a pull-rod suspension at Minardi in 2001. Which is probably why Ferrari decided to reinstall the system to make the Spaniard more comfortable in the car. This entry was posted in Formula 1 and tagged F14T problems, F14T pullrod suspension, Fernando Alonso, Ferrari, Ferrari pull-rod, Formula 1, Iceman, Kimi, Kimi Ferrari, Kimi Ferrari 2014, Kimi frontend, Kimi Lotus 2013, Kimi suspension, Kimi suspension problems. Bookmark the permalink. Maybe a few elements. But it’s hardly a copy and paste. Its a pretty good summary of the problems of this layout though. 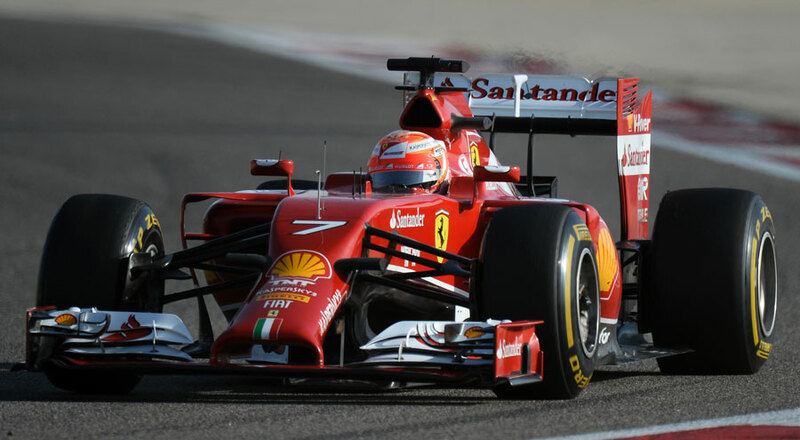 And once Ferrari goes back to push-rod, it will help Kimi a lot. Hello Red. I didn’t write the article in question. I merely reblogged it. I agree on the general aspect of the article. For example Kimis problems with the pull-rod suspension. But that doesnt mean I agree on every letter and comma. I also found the Minardi connection here a bit far-fetched. But that doesn’t mean one should discard the rest of it.